Home »Posts Tagged "Man of Steel"
In the mid 50s Jerry Siegel & Joe Shuster, fraternal friends from Cleveland, came up with the idea of a “villain” named “The Superman”. 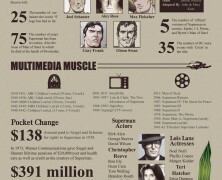 See how the story of the most famous superhero started and evolved into the Man of Steel we see today. In view of the forthcoming release of Superman’s sequel “The man of steel”, guys from Net Voucher Codes evaluated the cost of being the Last Son of Krypton – as well as mild-mannered journalist Clark Kent. They found out that the Man of Tomorrow is by far the thriftiest superhero around!